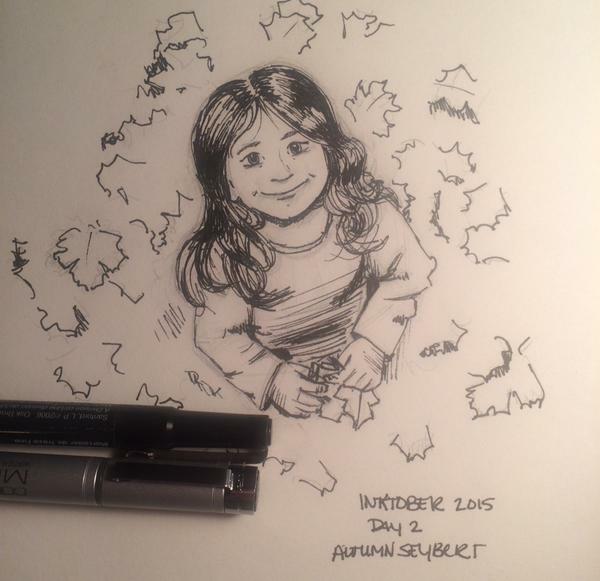 I know it’s not for another week and a half, but Inktober is coming! 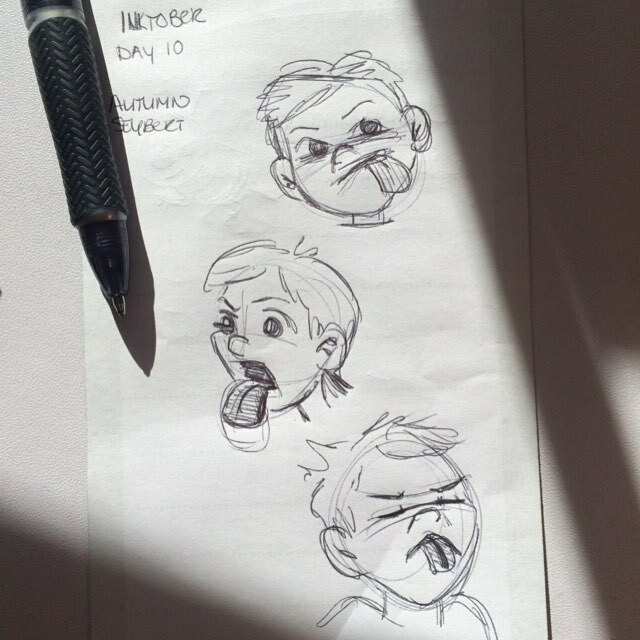 In case you are new and wondering what is Inktober, click this handy link to Jake Parker’s explanation. He’s the one who started this whole month of ink drawing! 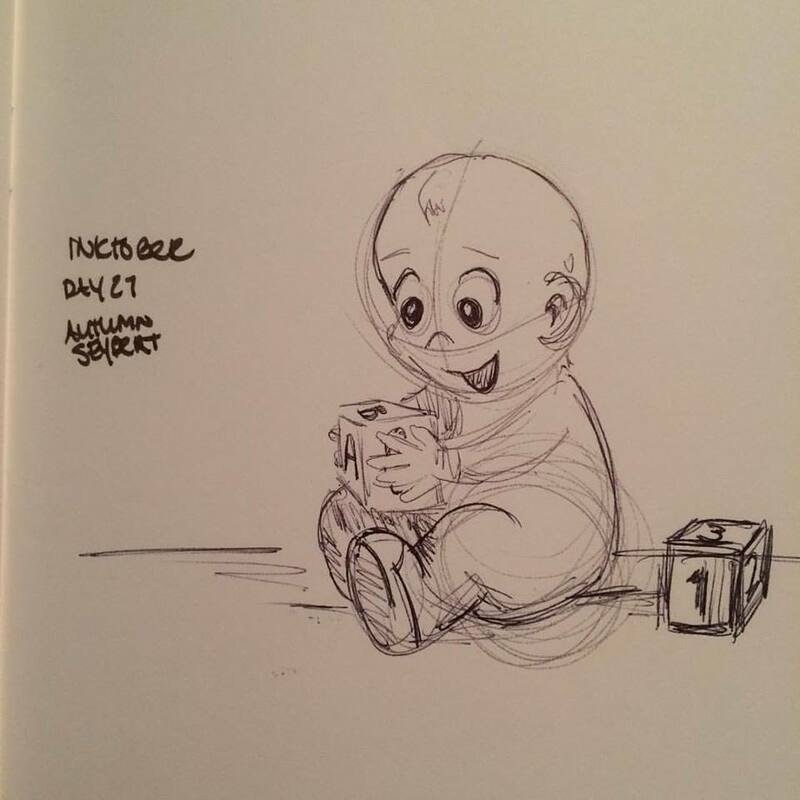 Last year was the first year I completed Inktober. 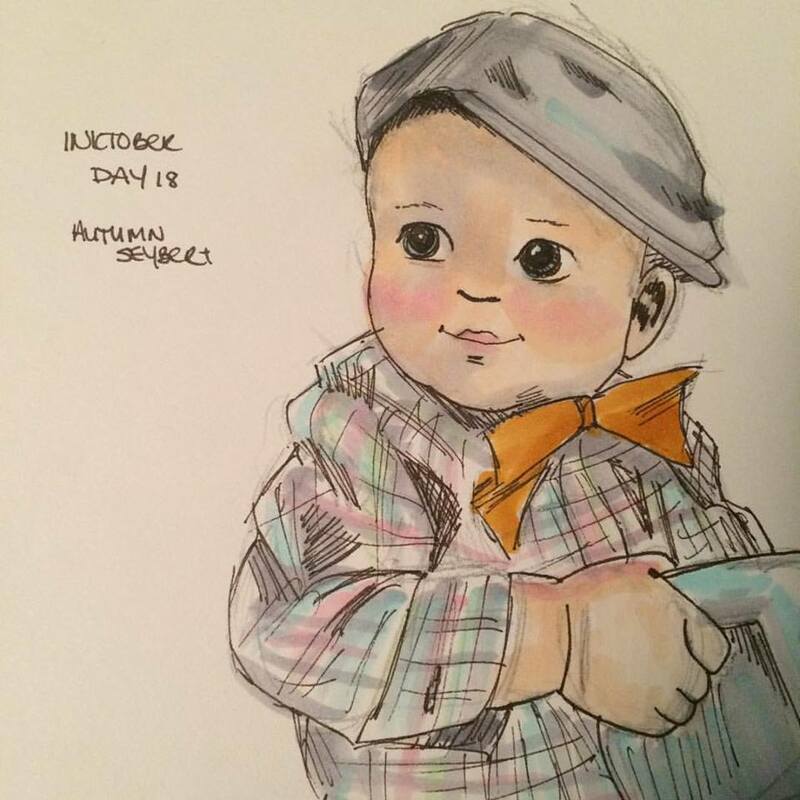 I’ve attempted a full month before, but for last year, I really wanted to get each day completed drawing different children. Here’s a handy link if you want to see last year’s work. This year, I am thinking ahead about what I would like to accomplish with this month. Do I want to focus on a topic like last year? Do I want to tell a story? Do I want to tell MANY stories? 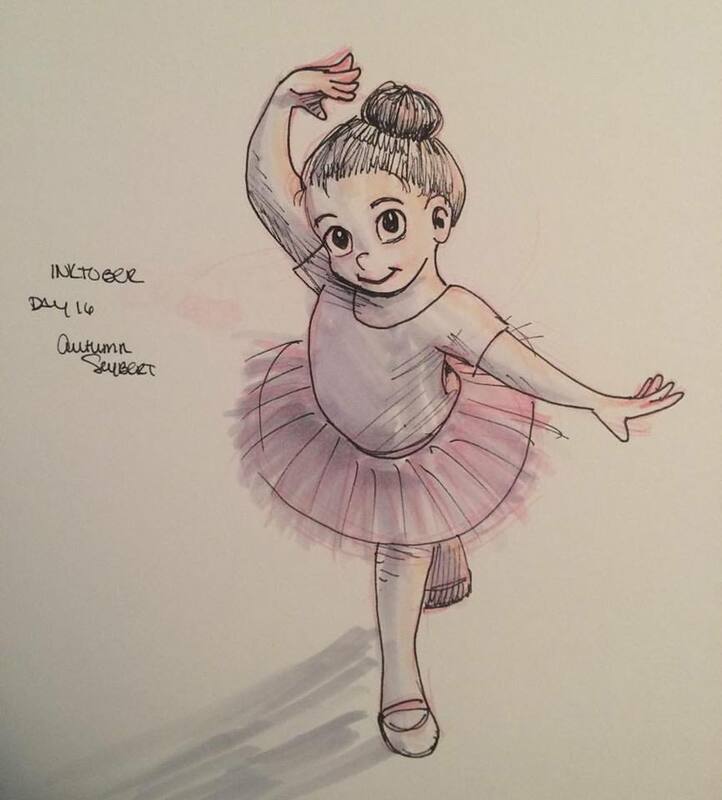 How much time do I want to spend on Inktober? Is it going to interfere with my work? Do I need to buy new tools or do I just want an excuse to go shopping? Lots of questions. Lots of decisions to make. 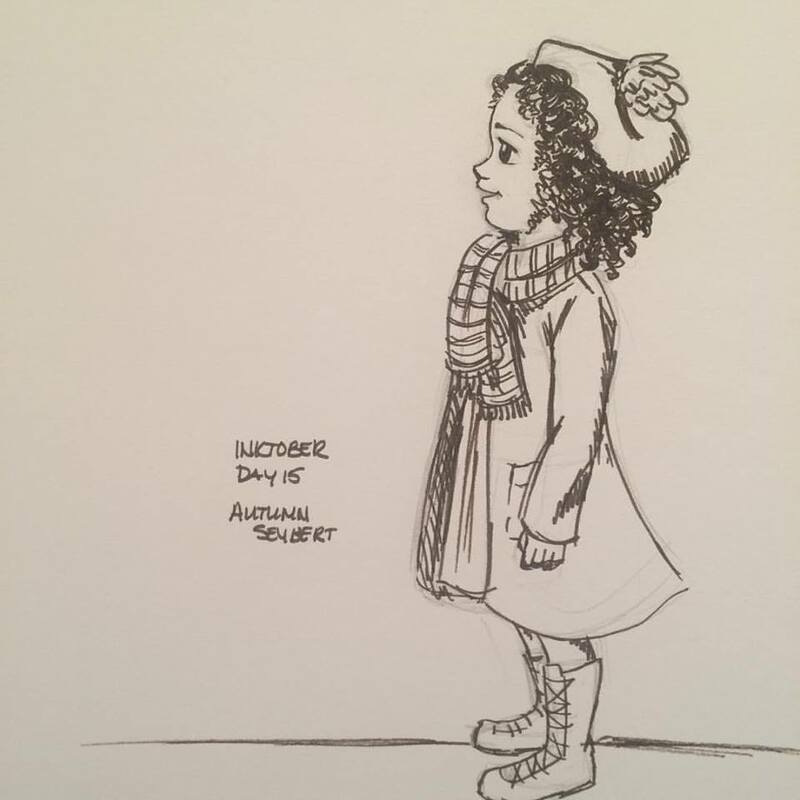 Are you participating in Inktober this year? Do you have a plan or are you going to to wing it? Do you have favorite tools? Day 8: This is one of my favorites, not just because of the result, but because of the process in drawing this boy. I loved his pose and expression in the reference photo, and it was an exciting challenge to capture that. 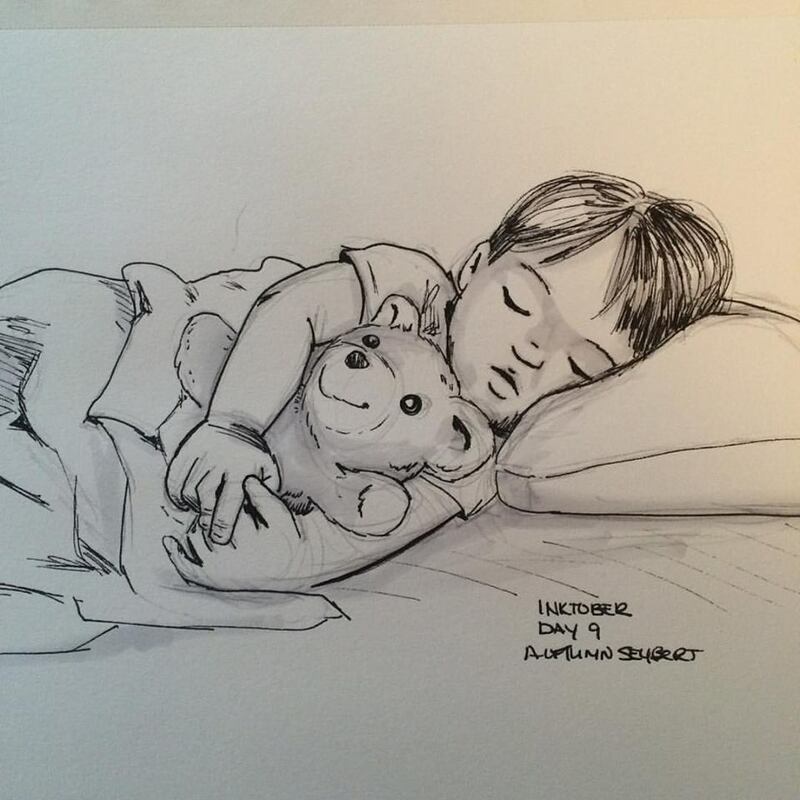 Day 9: I remember wishing I could take a nap, so this image really captured my wish for napping that day 🙂 I also have a soft spot for teddy bears. 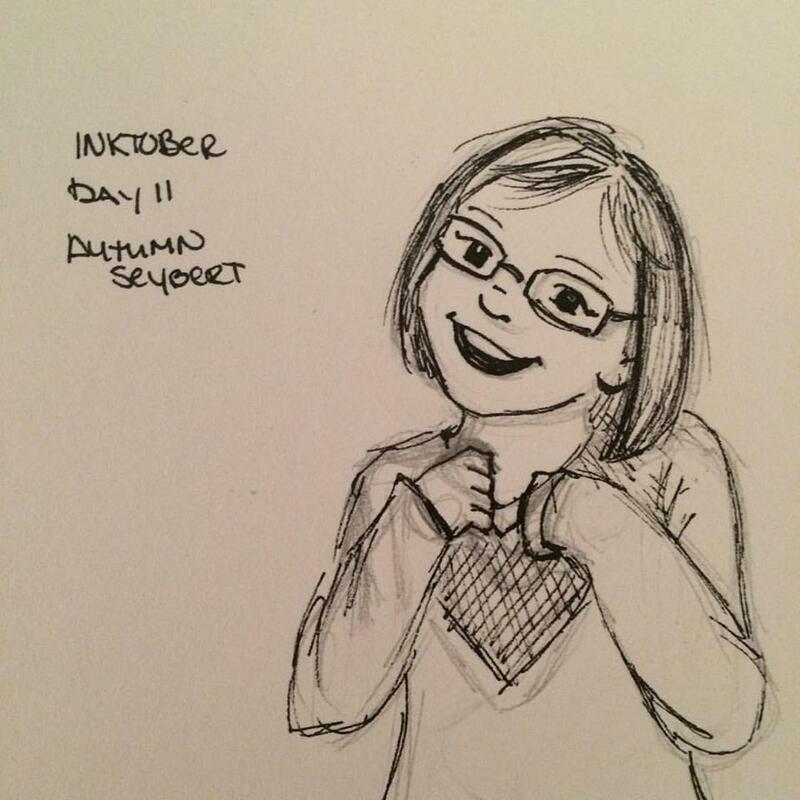 Day 11: I almost forgot to draw for inktober on day 11! I was so busy working on Warrior Cat that I drew this at the end of the day. I used 3 different photos of different girls to come up with this one. In the end she reminds me of a friend’s daughter, and I thought “I could’ve just looked at a photo of her!” 😀 Funny how our subconscious minds work! 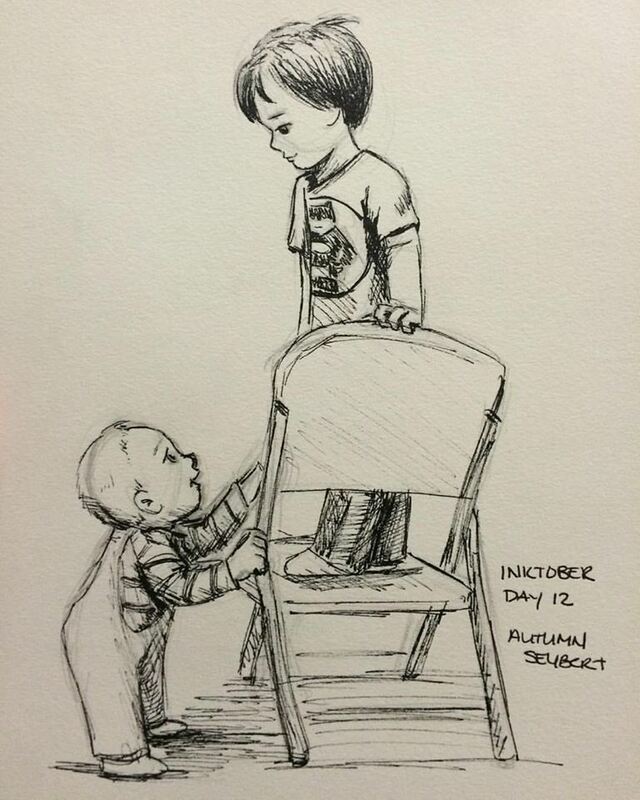 Day 13: I loved this photo sent to me. His sippy cup was HUGE and his book is HUGE and he carried them around like a boss. 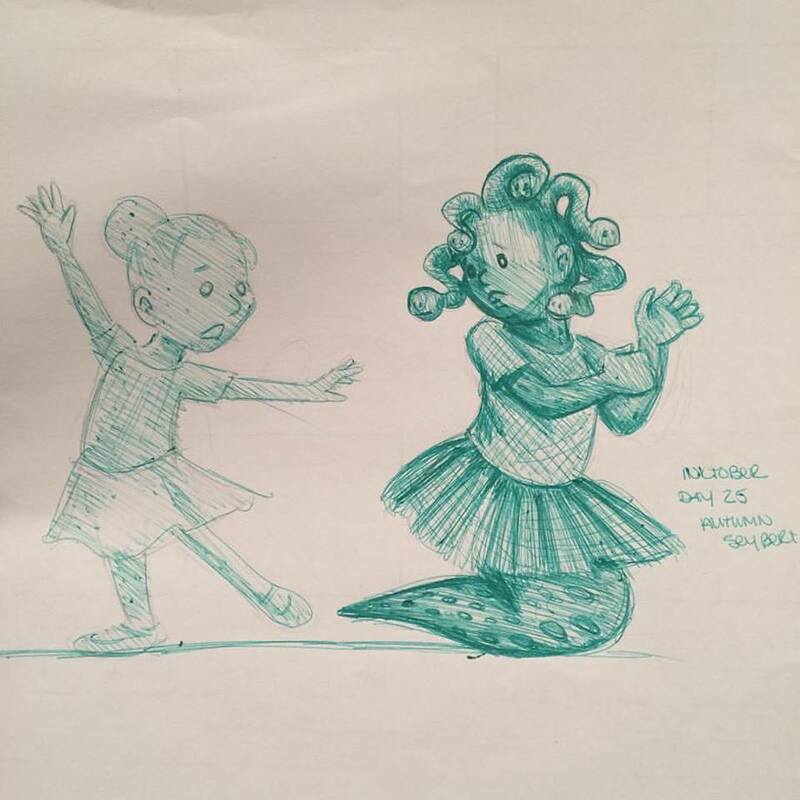 I am really having a ball drawing children this week! It’s been such a good exercise to study faces, proportions, and try to figure out markers and pens. 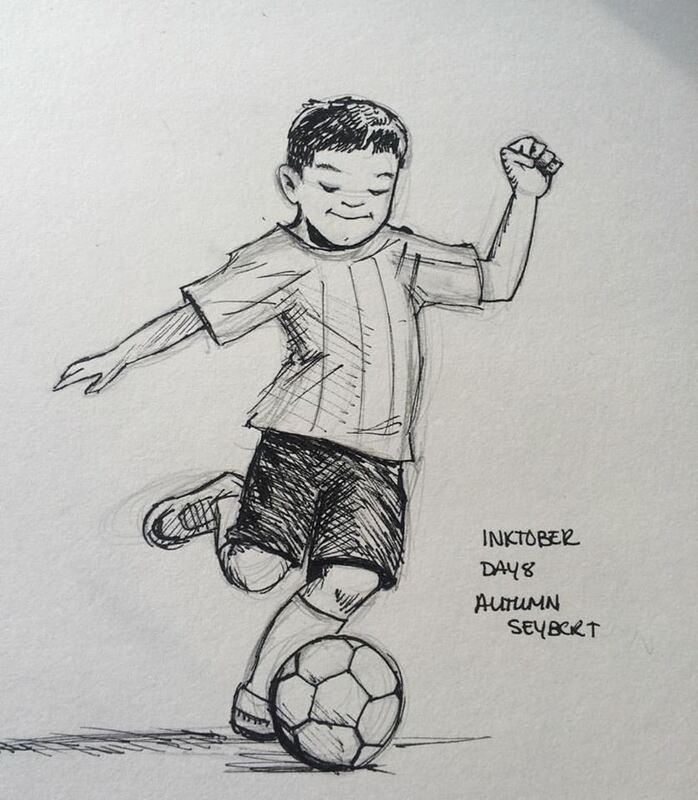 Using a topic theme like “Children” and just drawing every day reminds me how much I enjoy drawing. Even the days when I don’t love the results, I learn a lot, and it unlocks that determination of “I’m gonna keep going until I get it right!” mentality I had when I was a kid drawing horses. 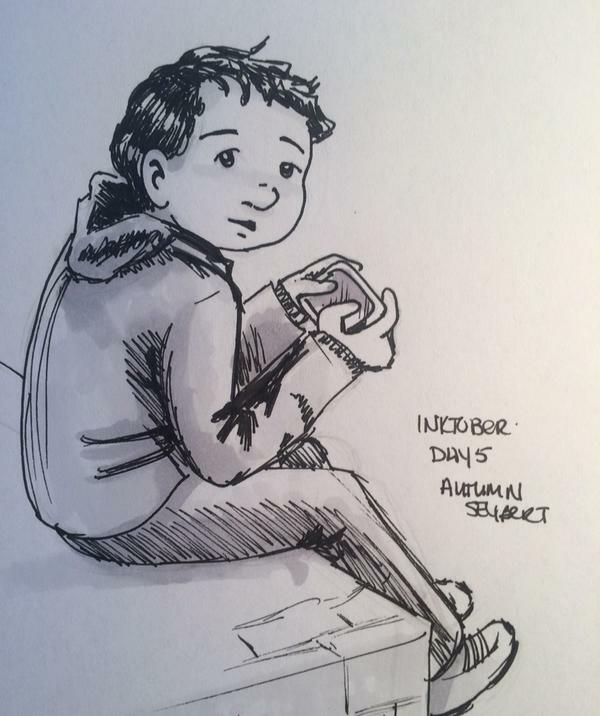 Inktober Day 1: I drew a small boy holding cookies. 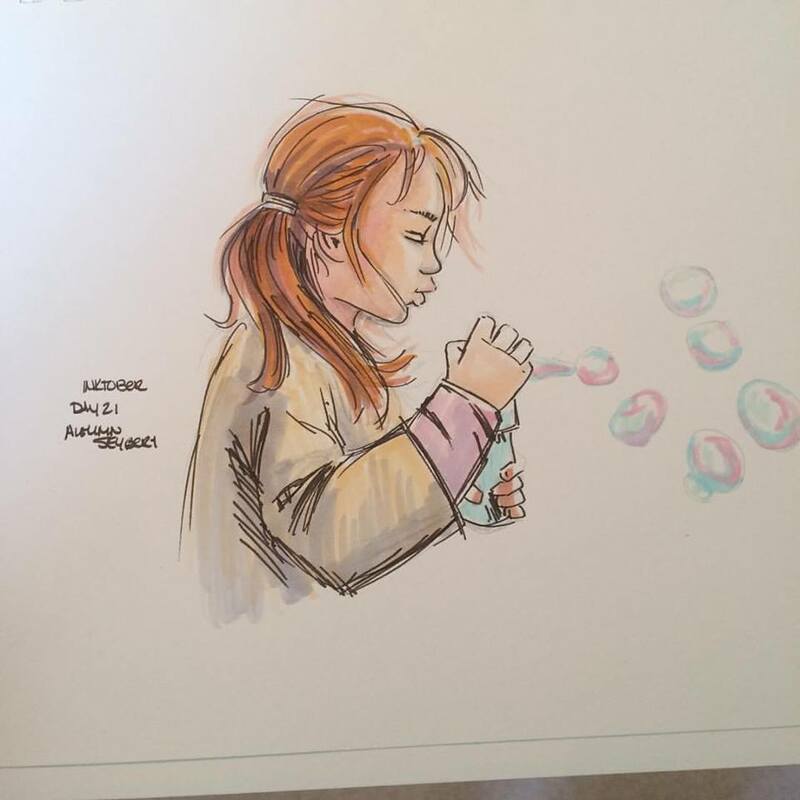 Using a Micron Pen and Copic Markers.. 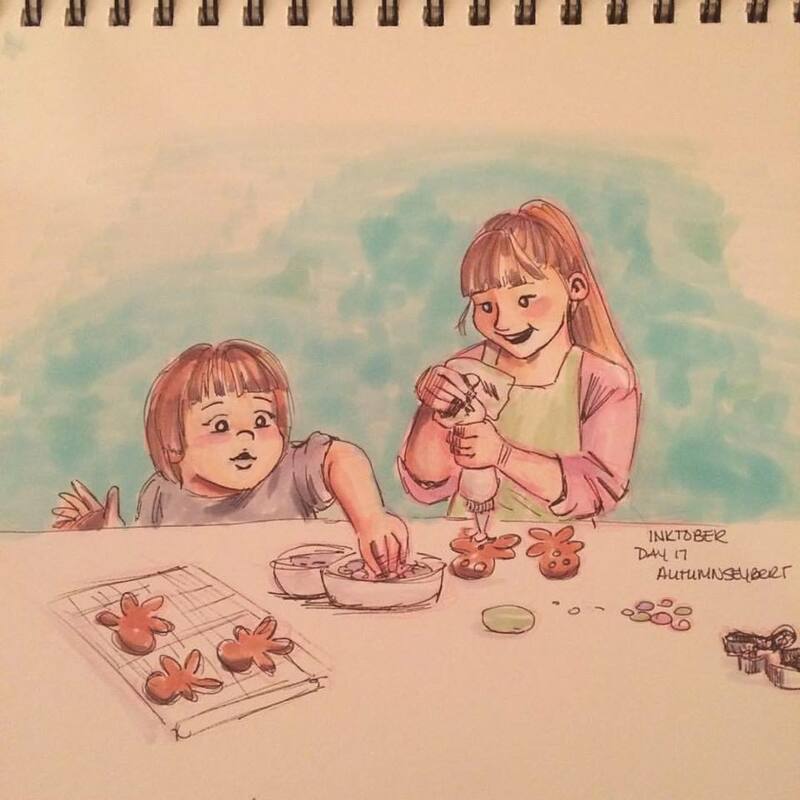 I don’t have an extensive Copic collection, most of mine are just shades of grey, but even with a few colors, I find I can push it pretty far. Day 2 Girl looks up. Ah perspective, my old enemy. I really enjoyed drawing this one. Thank heavens for photo references. I’m going to keep practicing this sort of perspective until we’re good friends. 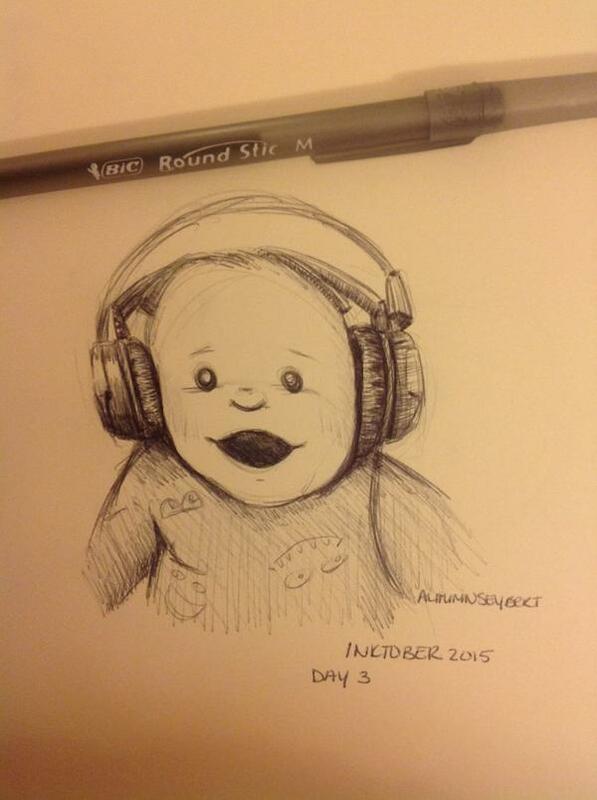 Day 3 Baby wearing Headphones. This one I did in the wee hours of the night. I couldn’t sleep and after staring at my ceiling, I decided to draw. The headphones are wonky in this drawing, but considering the circumstances, I gave myself a pass. If I was drawing this for a client though, I would’ve redrawn this until it was proportionally correct. 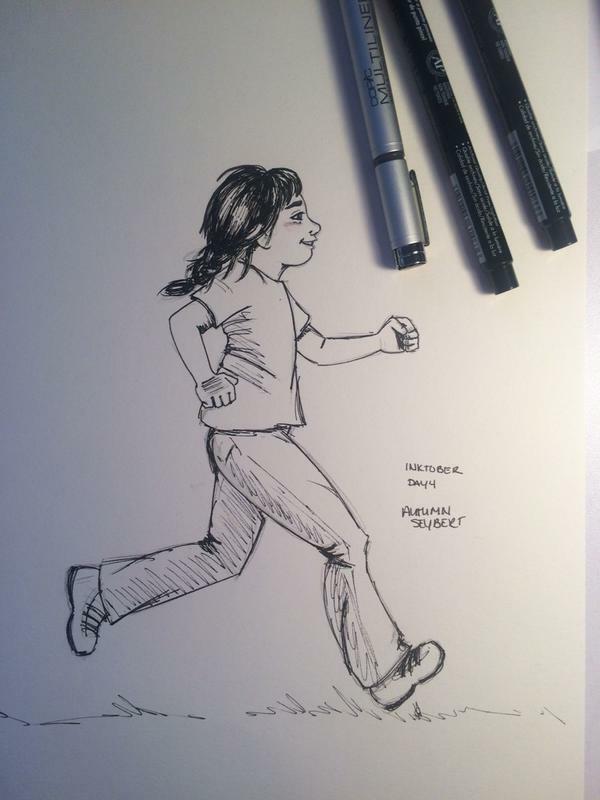 Day 4: Girl Running: This one I did have to redraw several times until I got it right. Chins in profile. This poor girl had many, many chins. Not all at once, but oh the sadness of her chins before this one. 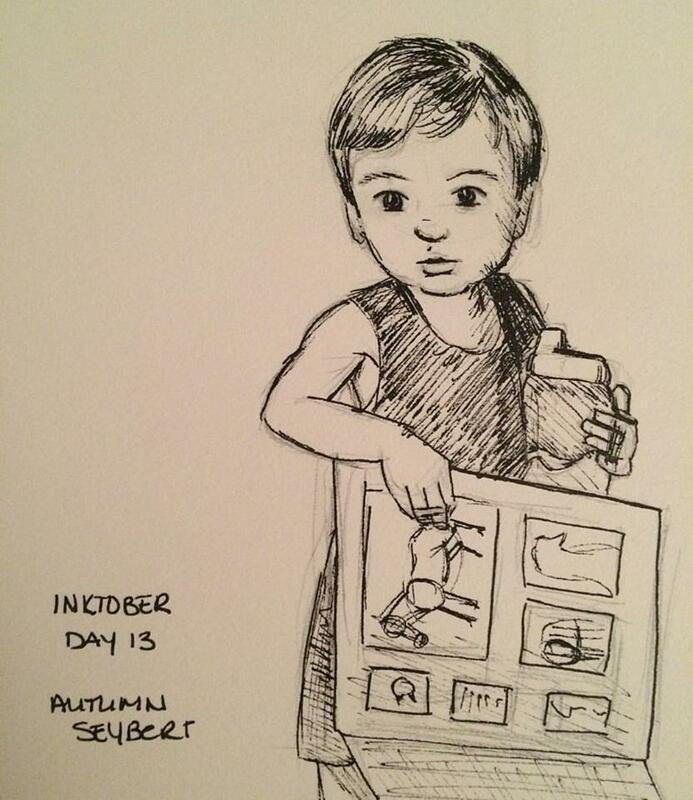 Day 5: Boy with screen. This one was fun too. I liked showing him from a different angle and drawing chubby cheeks. 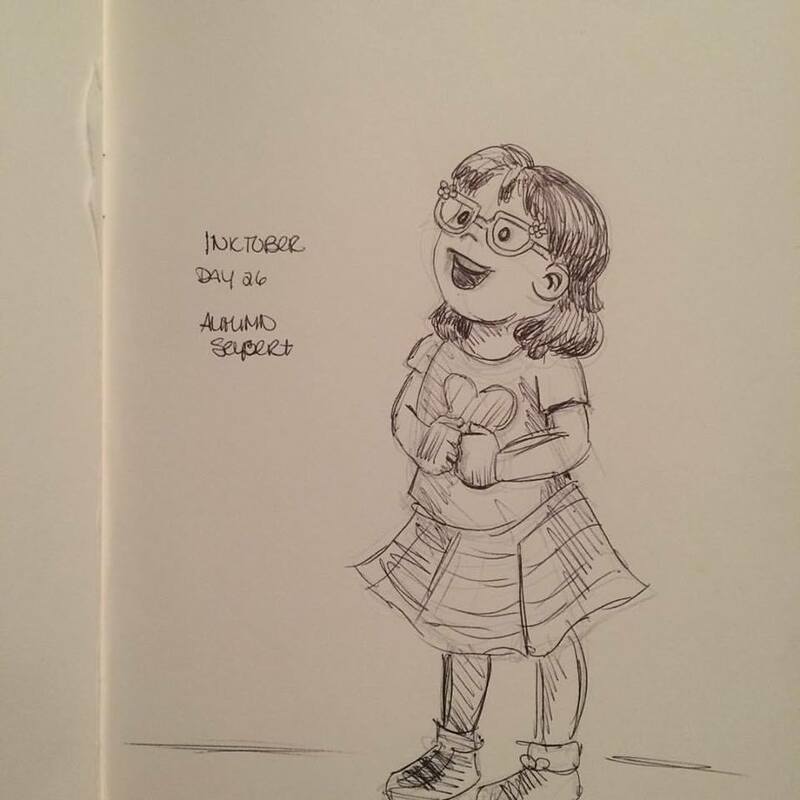 Day 6: Children’s Choir. 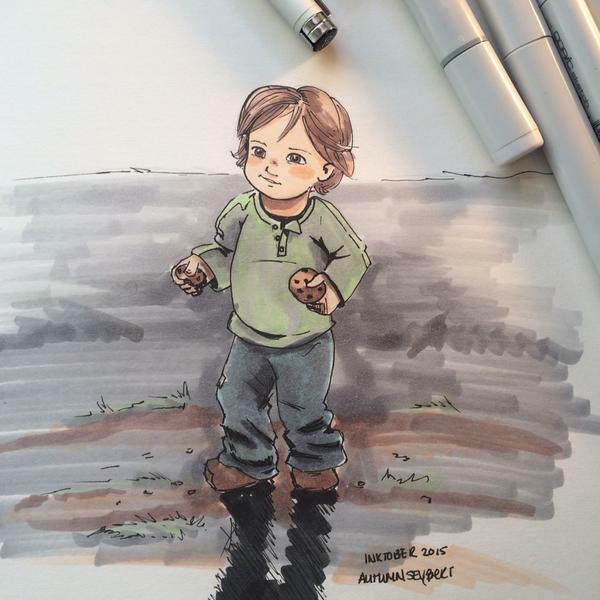 This was the one that I wish I had more markers to work with. 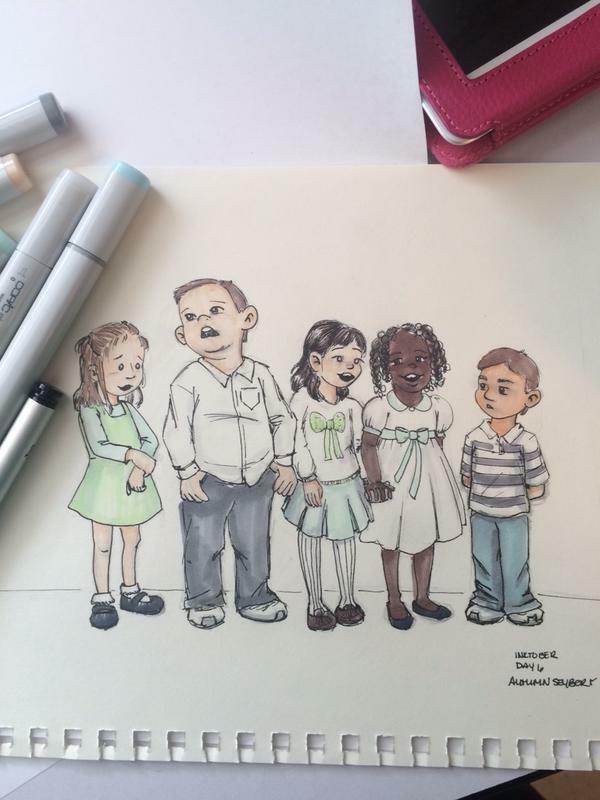 But I loved working on this one and showing a group of kids together. I plan on finishing this one in Photoshop and sharing it with you next week here on the blog. Day 7: Blowing out the candles. 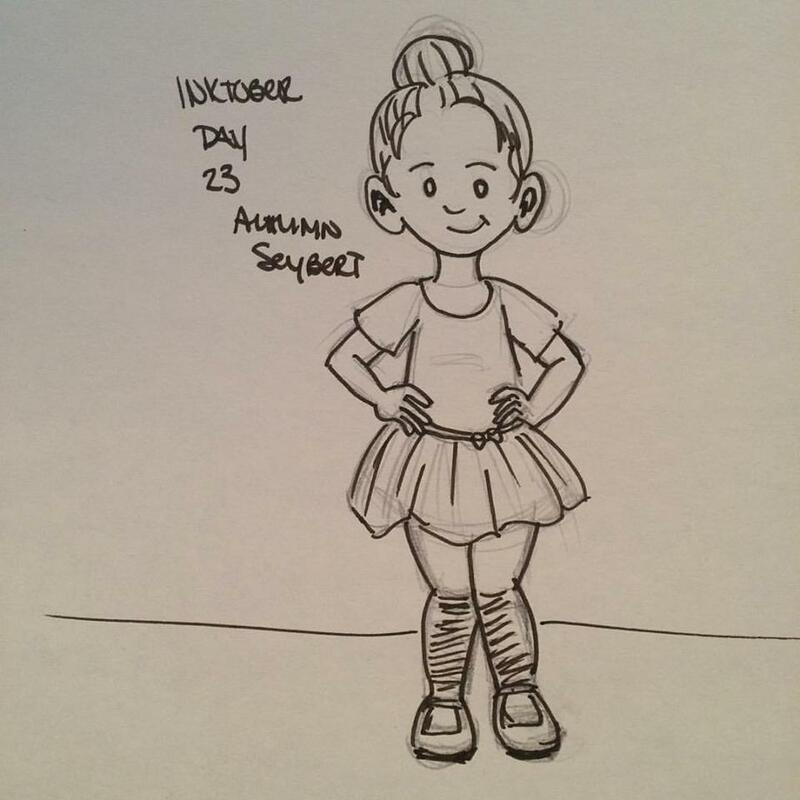 Inktober is a fun time for a lot of artists because it’s an excuse to draw anything every day and share it! How it works is easy! 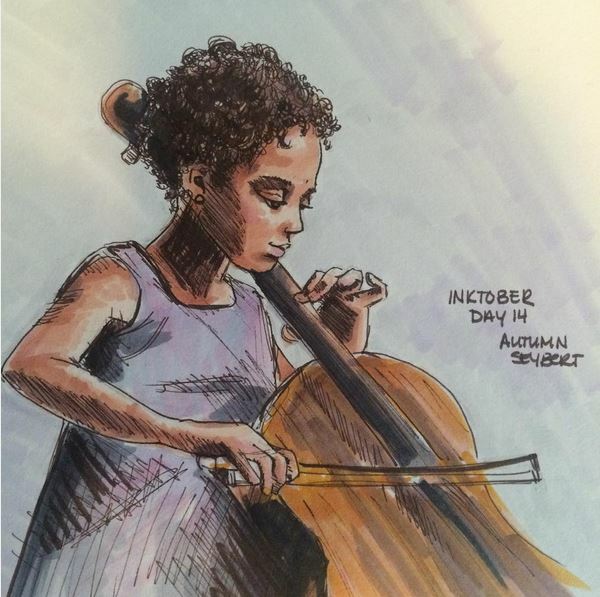 You draw something with pen or ink, share it online with the hashtag #inktober. 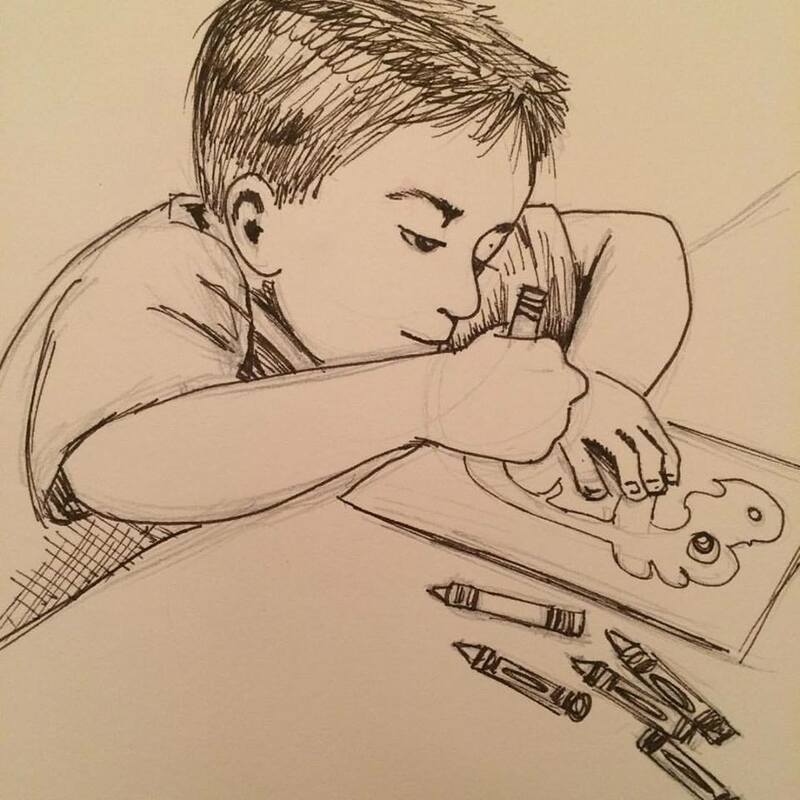 You can draw everyday, once a week, however often you wish! 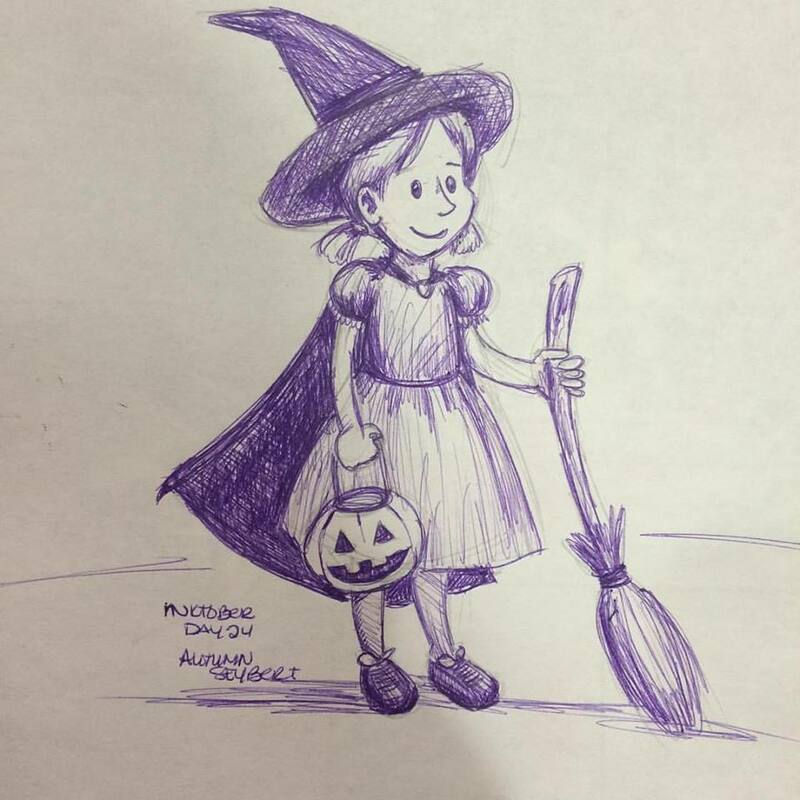 It’s a great drawing exercise and fun. 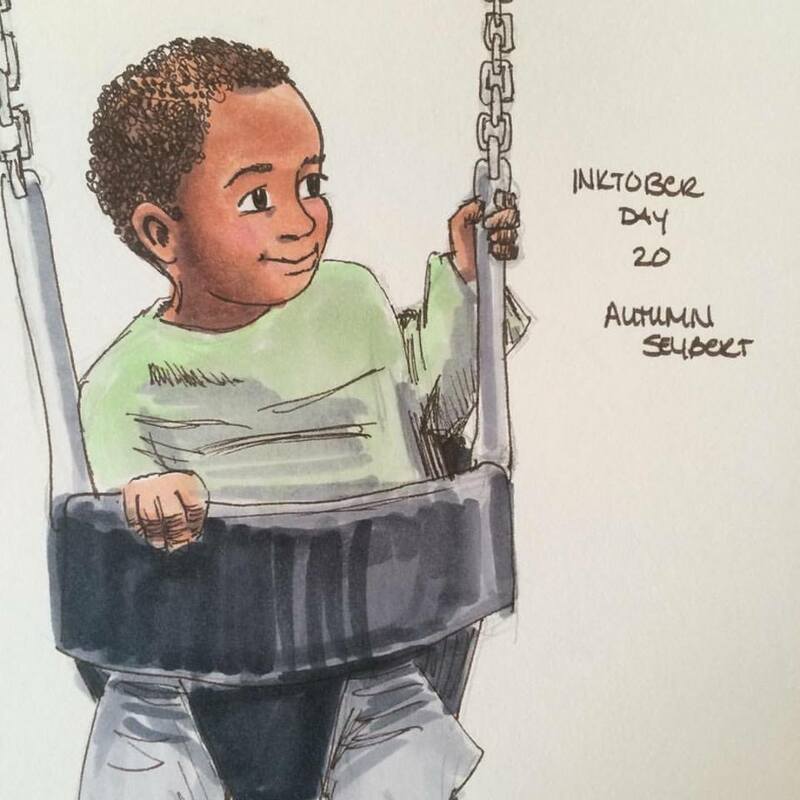 This #inktober, I’ll be drawing children, You don’t have to pick a theme, but for me, drawing children isn’t as easy as I’d like it, and this is a fun opportunity to try on different techniques and get a lot of good practice in. 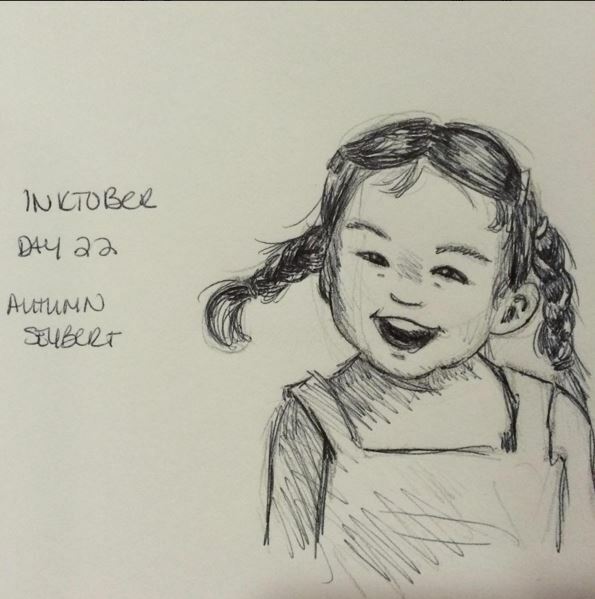 I’ll share my #inktober drawings on Instagram daily, and continue to update weekly* on this blog each Wednesday. 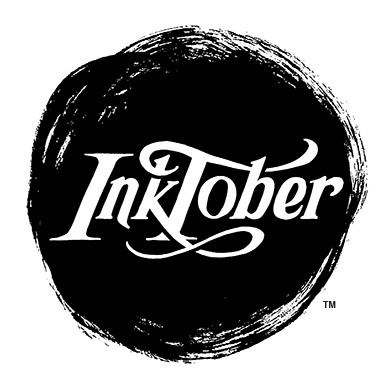 Read about Inktober from the creator, Mr. Jake Parker and download some cool templates and icons like the one you see in this post!